The whole point of BRT is the lower cost, right? Hartford, CT just received FTA New Starts funding for a BRT system. The capital cost is $572 million for all of 9.4 miles. Oh, did I mention it is to run on an abandoned rail ROW? Why does the AAA Hate Bicycles? So SB-910 (“Safe Passing Bill”) was given a public hearing in the Assembly Transportation Committee. And of course the AAA was there to oppose it. I say “of course” because it goes without saying that anytime a bicycle or pedestrian bill is considered, the AAA will oppose it. It brings to mind Assembly Bill 1408, which the AAA also opposed back in 2004. That bill clarified bicyclists’ right not to have to ride in Door Zones. And what’s baffling is that all AAA members are pedestrians, and quite a number ride bicycles too. I (kind of) understand efforts by the AAA to divert bike/ped monies to highways — but why oppose rules already in the DMV handbook? The Obama Administration proposes infrastructure investment — and the news media is filled with stories of under-performing high-speed rail lines in China, built with shoddy concrete. Now will Spain, which also built an expansive transport network, get the “China” treatment? Signs abound that Spain has not fully learned the lessons of its profligate spending. Spain recently announced a high-speed rail link to the sparsely populated northwest region of Galicia, a plan many economists see as an extravagance. Bridge and highway projects are plowing forward in the face of criticism that Spain just can’t afford them. Now, it is true that Spain built an excess of airport facilities (a lot of countries did). But highways and High-Speed rail lines? It would be hard to argue those investments were not frugal. For what the US spends on 1 mile of light-rail, Spain is able to tunnel 1-2 miles of subway. And until the financial crash, the Spanish government was running a respectable budget surplus. Now state rail planners want to run the high-speed rail line along Interstate 15, which brings its own problems. Chief among them is that it would seem to eliminate the possibility of a local and long-talked-about light-rail line running from Escondido to San Diego proper along I-15. While we continue to believe that scarce transportation funds should be put into those methods that most people use —- i.e., freeways —- surely a light-rail line like the Sprinter or Coaster, or even an extension of the San Diego Trolley, makes far more sense than an expensive, intrusive and highly controversial bullet train. This is certainly not the first time a newspaper editorial has raised the issue of HSR vs. local transport. 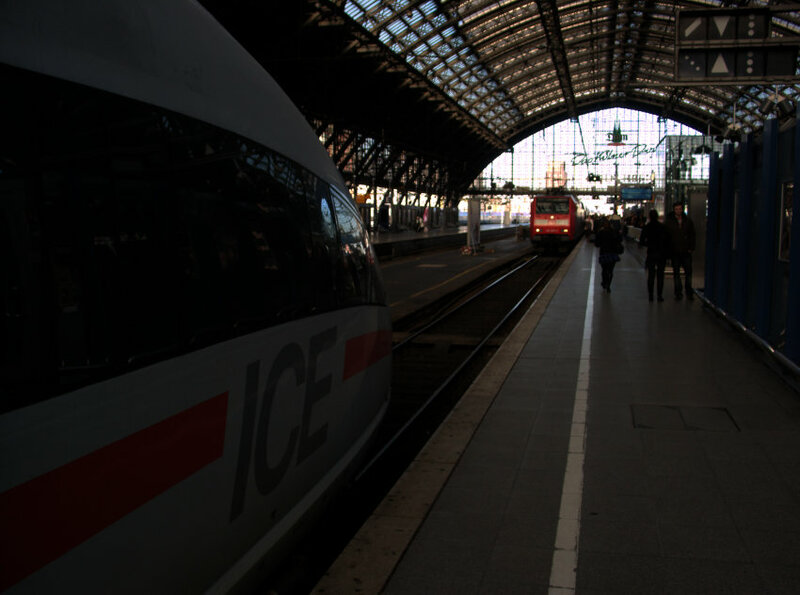 It is a false dilemma because it presumes railroad tracks cannot be shared among a multitude of services. Within urban areas, HSR trains will be traveling at conventional speeds anyway. And HSR is not like a metro, with trains running every few minutes. There is any number of ways an I15 alignment could be engineered to incorporate an extension of the Sprinter service. Indeed, that should be the goal! And it would be not complicated either, as Sprinter already uses UIC-spec, non-FRA-compliant rolling stock. The real blame here is not with Editorial writers, but the CHSRA itself. They seem utterly uninterested in the regional/commuter benefits of this new infrastructure. If CHSRA won’t promote the local benefits of new ROW, then no wonder Editorial writers are confused. The Bay Area’s MTC has long been known for prioritizing road and rail projects at the expense of bus operators. So when the MTC initiated a cost analysis of the region’s bus operators, transit activists were understandably dubious. The project sounded like a “blame the victim” study. But preliminary study results reveal some interesting numbers. Adjusted for inflation, operating costs for the major bus operators increased by 27% over the past 10 years, while revenue vehicle hours were almost unchanged — increasing by a mere 4% over the same time period. 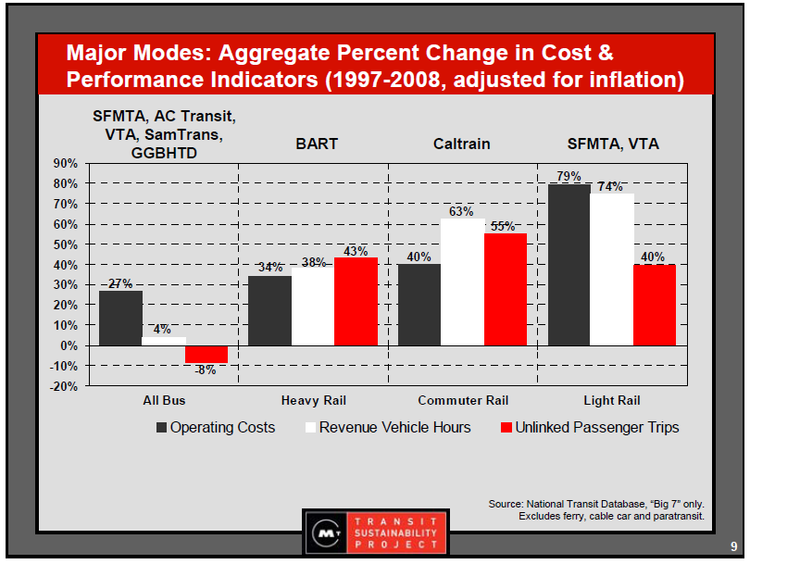 Rail agencies also saw major increase in operating costs, but that was offset by increased service. Does this indicate bus driver salaries and benefits are out of control? Not necessarily. Comparison to other metro areas, such as Boston, Chicago, and New York shows Bay Area is in the mid-range for compenstation (though pension and “fringe” benefits are at the upper tier). Interestingly, the study does find Administration costs are out of line. For the Bay Area 7 largest operators, Administration makes up 20% of the operating cost, compared to 16% in Los Angeles, and 9% in Boston. This suggests some consolidation may be needed. The International Air Transport Association (IATA) has lowered its global industry profit forecast by 54% to $4bn from a previous forecast of $8.6bn in March and a 78% drop compared with the $18bn net profit recorded in 2010. The international industry body blamed the natural disasters in Japan, unrest in the Middle East and North Africa, as well as the sharp rise in oil prices. Undoubtedly the irradiation and sexual assaults had something to do with it too…. appoint an executive director, thereby leaving the authority without a focal point to hold accountable for carrying out its mission. For the record, I think the 2003 recommendation was wrong, and that events over the past 8 years demonstrated the CHSRA was in way over its head.